With our summer season drifting into August, there is still time to visit our mountain wilderness here in California. I’m talking about two separate areas and both are a quarter of a mile from each other. 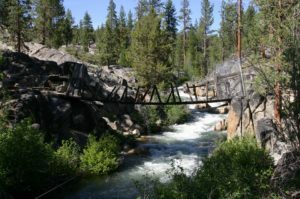 Ansel Adams Wilderness with all its high country trails and Mono Hot Springs with cabins, General Stare, Café and tent campsites along the San Joaquin River. This drive is only 90 miles from Oakhurst and almost the same millage from Fresno. 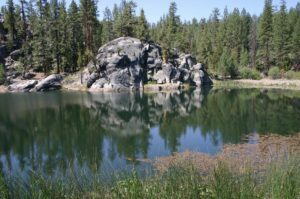 Drive SR168 past Shaver and Huntington Lakes, then over Kaiser Pass to Mono Hot Springs. Here is your ideal area for your base camp. 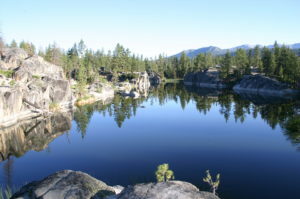 One popular lake only 45 minutes from the Mono resort is called Doris Lake which was named after Walter Hill’s daughter. Walter was Mono’s original builder which started in 1936. Doris Lake is thermal heated with summer time temperatures around 76 degrees. Swimming is defiantly an option followed by Trout fishing and just sightseeing. Another popular day hike starts from the same trail leading to Doris Lake but at the first junction follow the trail to the left which states Tule Lake. At the second junction follow the sign toward Edison Lake. 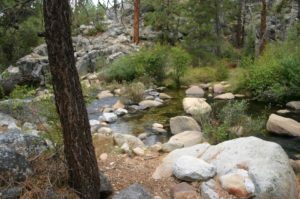 This trail follows to Mono Meadow and Mono Creek. During the spring season this meadow is covered with wild flowers boosting colors of white, yellow and purple. Another option following this trail and if one starts early in the morning, cross Mono Creek and follow this trail to Edison Lake Vermilion. Have lunch and return by the same trail for a total hiking time of four hours. Another day hike is to Big Mono Meadow located around 20 minutes past Tule Lake. Hike the same route from Mono Hot Springs but turn left at both trail junctions. Or follow the signs that read; Tule Lake. This lake is also thermal heated and has the distinction of being the only mountain lake higher than 7,000 feet supporting small mouth bass. It is also another great lake for an afternoon swim. Continue past Tule Lake and in less than 30 minutes you’ll arrive at a large meadow with Mono Creek flowing along its borders. Round trip to visit both sites is estimated to be around three hours. 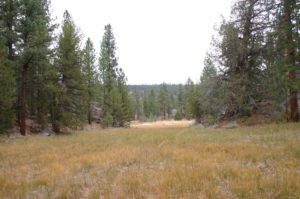 Within this meadow is another trail junction. One trail leads to Mosquito Crossing which crosses Mono Creek and will introduce you to another large meadow on the opposite side. No bridge, one wades across the creek or look for a fallen snag to cross. The second trail is not for the beginner. The southern direction leads to Mono Crossing and Rattle Snake Crossing (not a day hike). The north direction is also confusing; it has a nick name of; The Enchanted Forest. From years of cattle grazing the main trail is confusing. If Edison Lake is your objective, use the trail I identified earlier. If day hiking is your specialty and you’re on a budget; Mono Hot Springs, Edison Lake Vermilion and Florence Lake should be part of your outdoor activity this summer. Trails in this area are easy to moderate. Remember you are in the wilderness and if you are confused with any trail, ask for directions. Rule of thumb; stay on trails if not accompanied by a guide.